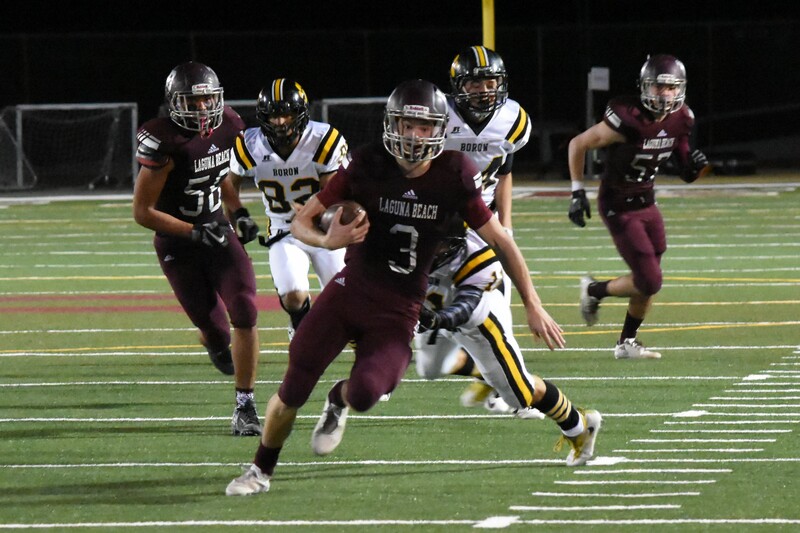 Breakers stopped Boron’s vaulted runners on literally the one-inch line with 92 seconds remaining to preserve a 21-14 victory and advance to the semifinals for the ninth time in the 82-varsity season history for Laguna. Laron Cherry and Emilio Gutierrez, the Bobcat’s heralded backs, had been a key part of the 16-play drive, but the final yard proved elusive. The Breaker two-way players, Adam Armstrong, Matt Hayes, Sean Nolan and Curtis Harrison, provided the brick wall for the scoring attempt. Breakers will advance to the Division 13 game this Friday, Nov. 25, against Santa Ana (12-0) at the Santa Ana Bowl. Current kickoff time is slated for 7:30 p.m. Breakers and the Saints have met twice with Santa Ana winning 6-0 in 1953 and Laguna pulling off a 39-14 upset in the 2008 CIF playoffs. Santa Ana is officially 12-0 this season, but that includes a forfeit by Orange which defeated them 31-29 on Oct. 6. Breakers lost to the Panthers 48-17 but trailed only 7-3 at halftime. The other common opponent is Calvary Chapel that narrowly lost to Santa Ana 27-24. Breakers defeated their league rival 39-14 earlier this month. Laguna was led by junior quarterback Curtis Harrison who scored all three touchdowns rushing for 42 yards and passing for 164 to set the single season total offense record for a quarterback with 2222 yards. Also key for the win was running back Matt Hayes with 113 yards on 13 carries with including 22-yard run to help run out the lock in the closing seconds of the contest. Sean Nolan also came up big with an interception that set up Laguna’s second score and three catches for 40 yards.